If you asked me before I went abroad what a kebab was, I would think of the skewer stacked with roasted meats and vegetables. In Europe, “kebab” has a completely different meaning. Döner kebab is an incredibly popular dish made up of seasoned meat that is shaved from a vertical rotisserie and topped with fresh vegetables and sauces. 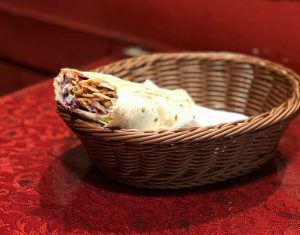 Döner is similar to the Arab shawarma and Greek gyro and is famous for its late-night accessibility. Throughout every European city that I have visited, döner kebab has always been easy to find when I am in need for quick meal between museum tours and bike rentals. The roots of döner kebab started when Mahmut Aygun, the “Kebab King”, saw the opportunity to transform a traditional Turkish dish into a mobile meal by serving spiced meat in a pitta bread instead of with rice. Aygun sold his first döner in 1971 in Berlin and the rest is history. In Europe, there are over 200,000 hardworking individuals that are a part of the $16.5 billion kebab industry. Multiple organizations have formed to promote the dish and advocate for its workers, such as the Association of Turkish Döner Manufacturers in Europe and the German Association of Döner Kebab Producers. This flavorful sandwich can be found throughout every major city in Europe and the restaurants are always packed with hungry visitors. Döner Kebab Durum Wrap- my favorite style of kebab! Although this dish is a personal favorite of mine and millions of people across the world, a few individuals have tried to take down this culinary powerhouse. 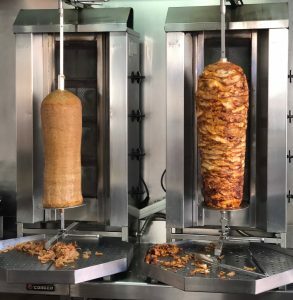 Many kebab shop owners rely on phosphate additives to ensure that the delicious seasoned meat stays fresh for customers 24/7, and that has led to controversy among the European Parliament. Per EU regulations, the use of phosphate in meat products is banned, and döner kebabs are not yet listed in this legislation- making it accessible to millions of hungry citizens. 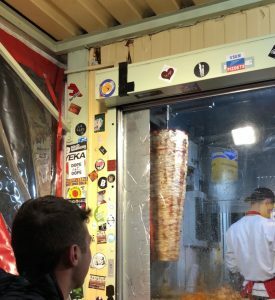 In a recent hearing, the parliament’s health committee claimed that the use of phosphate additives in kebab meat could lead to heart disease, but the attempt to regulate further use of phosphate additives fell through, thus allowing the booming döner kebab industry to continue to fuel the European economy. 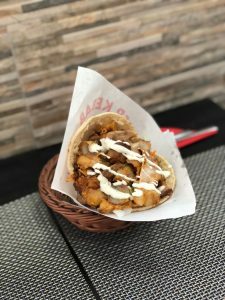 Döner Kebab Pitta- the classic! How can this dish be so popular? 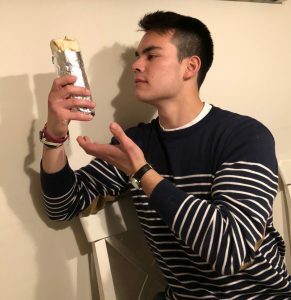 The scrumptious Turkish dish has two main canvases that the artists craft their masterpiece upon: the traditional pitta kebab, and the durum (a burrito-like wrap). These restaurants are known for its abundance of locations, and a shop can always be found within a few blocks. Kebab joints are also famous for their late-night hours, offering customers to fill their cravings for exotic meats anytime of the day. As a college student, cost is always a factor in my food purchasing decisions. Kebabs are usually between $2-$4, cementing döner as the perfect meal for those looking to save money. Enjoy fast service? These restaurants have patrons in and out within five minutes, quickly and skillfully crafting this delicacy. This unique mix of swift and cheap service for filling food is unrivaled. While the base food stays the same, there are clear variations within each country, such as open-faced wraps in Budapest and an emphasis on seasoning in London. Throughout my travels and döner kebab tastings, I have found that Brussels boasts my favorite kebab. I arrived at this decision based on the unique menu, perfection of roasted chicken, free French fries within the wrap, and crunch of the fresh vegetables. When I head back to the U.S. in May, I will miss all my new friends that I made this semester- especially döner kebab. My friend Adam in awe of a beautiful spinning lamb. Once he ate four kebabs in a day!